Formerly low-key site for partner sales professionals gets a new share of the limelight. Until recently, Microsoft Gear Up had a reputation as kind of a stealth site for partners. While the Microsoft Partner Portal is the official place for partners to go for most of their self-service resources, the portal sometimes suffers from the bureaucratic sclerosis that afflicts large, official projects in huge organizations. When it could take weeks or months for new tools, case studies or sell sheets to clear all the approvals necessary to get placement on the Partner Portal, Gear Up could have items up in no time. It was from Microsoft, but almost outside Microsoft. It was somewhat akin to a Google public beta project. The days when Microsoft Gear Up flew under the radar appear to be over. No less a personage than Microsoft Chief Operating Officer Kevin Turner brought attention to Gear Up during a keynote at the Microsoft Worldwide Partner Conference (WPC) in July, calling it a "very important strategic tool" for partners. "We have something called Gear Up. If you don't know what Gear Up is for partners, I encourage you to go to the Microsoft Partner Portal and check it out. It's the greatest single sales tool that we have in all of Microsoft. It's the only place you can go to get one consolidated look [at] all of our products, solutions and licensing scenarios in one location," Turner said. Along with a higher profile, Gear Up has been overhauled and stocked with new resources. If you haven't checked it out, there are a lot of good reasons to take the time now. As Turner suggested, one way to get to Gear Up is from the Microsoft Partner Portal. When I tried this method, I couldn't quickly find a link from the Partner Portal, or at least not the way the portal is configured for me at the Registered Member level. Even if there is a link to Gear Up from the Partner Portal, using that route defeats the purpose of the Gear Up site in many ways, which I'll explain later. The easiest way to access Microsoft Gear Up is by typing in the ms-gearup.com URL directly into your browser. The Microsoft Gear Up site boasts a redesign, fresh content and navigation improvements for partner sales professionals. The home page at Gear Up welcomes users with a note indicating that the site is designed to connect partner sales professionals with information and resources that will help them increase and close sales. It also details some of the changes: "The Web site has been updated with fresh content and easier navigation to enable you to quickly locate necessary information to perform your role." The site is organized into eight areas by its navigation bar: Home; Sales; Products & Solutions; Licensing; Marketing; Tools; Training; LicenseWise. The Sales section is among the richest areas, given the whole site's emphasis on useful materials for partner sales professionals. A Sales Preparation area includes 11 sales scripts covering Microsoft solutions, Microsoft products, renewal/licensing and competitive conversations. The section includes another half-dozen supporting documents, such as e-mail scripts, white papers and Excel grids. Another section provides about 10 resources to help partners sell Essential Support to customers. Rounding out the sales section is a page about IT best practices and evidence from Microsoft's own IT department "dog-fooding" Microsoft products and solutions. Another content-rich area is Products & Solutions, which combines sales tips and resources for each of 15 products. Covered in early September were Office 2007, Visio, LiveMeeting, Project, TechNet Plus Subscription, Windows Vista, Small Business Server, Windows Server 2008, SharePoint Portal Server 2007, Forefront Suite, Dynamics, Dynamics CRM, Exchange Hosted Services, Exchange Server 2007 Service Pack 1 and Office Communications Server 2007. The Licensing section contains many resources aimed at simplifying licensing for partners and clarifying business opportunities. On the concrete side, it includes links to the Microsoft U.S. Price List and the Microsoft Incentives page. The Marketing section is fairly light, with a link to Microsoft's ProSource branding and logo site, a Partner Marketing Calendar and a Vista-related "Upgrade the Desktop" campaign. The Tools section contains links to the Sales Tool Kit, which brings together information on all Microsoft products in one booklet; the LicenseWise tool, formerly known as the Licensing Configurator; a Software Assurance Benefits Calculator; academic quoting tools; and MIKE, or the Microsoft Intelligent Knowledge Engine, which provides a searchable database of sales tools. 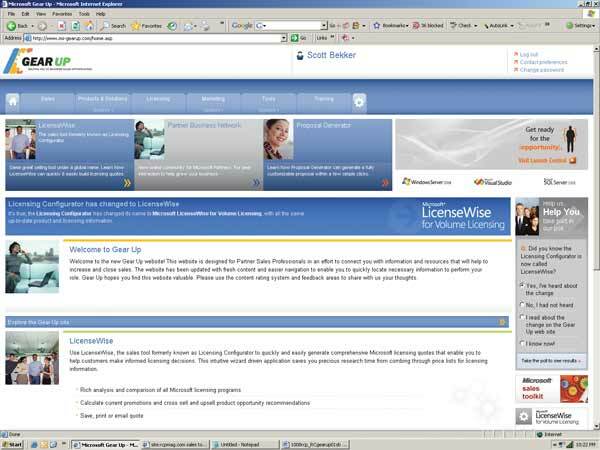 LicenseWise, an area of heavy emphasis on the Gear Up site, also has its own section on the Gear Up navigation bar and is promoted separately on the home page. The other major section is Training, which provides links to Foundation Courses for new employees at partner companies, the Microsoft Partner University, the Partner Learning Center and the Microsoft Licensing Trainer. Aside from the site's core organization, Microsoft is using Gear Up to call special attention to several tools by dedicating site real estate to them across several pages. These include the Sales Tool Kit, the peer-to-peer Partner Business Network, the Proposal Generator and the Ready-to-Go Marketing campaigns. Microsoft makes no secret of one issue with its main Microsoft Partner Portal-elements of the site's organization make it awkward for companies to allow more than one employee to use the Microsoft Portal. In many cases, several employees at one partner company sign up individually in order to use the Partner Portal's resources, creating confusion among partner employees about who "owns" the company's listing in the Microsoft Partner Program. In other cases, branch offices of partner companies set up different accounts. Microsoft is working on those issues with the Partner Portal. But Gear Up solves those problems by making sign-up a snap that doesn't confront new users with thorny questions that they will need to approach higher-ups to answer properly. After filling in a few blanks, new users are immediately surfing among tangible resources such as cross-sell scripts and U.S. price lists. What's more, unlike in the Microsoft Partner Portal, no resources are hidden behind lock symbols. A few resources require logging in to a different page, but in most cases, accessing those resources is as easy as signing in to Gear Up itself. Gear Up isn't even trying to be comprehensive. The emphasis on this site is quick and dirty, with the focus on putting the most useful tools in front of the greatest number of partner sales professionals. Still, the site would benefit from filling out areas like the sales-related customer evidence with more of Microsoft's case studies. Meanwhile, partners pushing Windows Server 2008 and SQL Server 2008 won't get much help from case studies involving Windows Server 2003 R2 or SQL Server 2005. 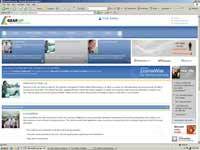 Also, it would be good to have competitive scripts more current than the one positioning Exchange 2003 against Lotus Notes and Novell Netware. Microsoft Gear Up is a powerful resource for partners, especially for lower-level sales professionals and new employees needing some free and quick online training. It's also exceptionally good at surfacing some of Microsoft's best tools, which are often obscured on the Partner Portal or take awhile to reach that "official" partner site. While the great strength of Microsoft Gear Up is its flexibility, one weakness is its previously low profile, which means relatively few partners have used the site. Now that the site is getting executive attention at Microsoft's highest levels, let's hope that Microsoft Gear Up can still stay nimble.